One of my favorite go-to shops for classy wardrobe essentials is having a 50% off sale until midnight tonight! Just use code: SHOP50 at checkout to get half off your purchase at Ann Taylor. I'm sharing my picks for dresses, skirts and a few accessories too with a focus on pieces that can be worn to the office during summer, a season which can sometimes bet tricky when it comes to the workplace. They offer beautiful office attire for a polished look, classic pieces that you'll wear for years to come. You can scroll the side arrows to see the next item and can click on any image to be taken directly to the source for more details. Many of the items I'm sharing are available in regular and petite sizes and if you're tall like me, great news! Ann Taylor stocks tall sizes also. I especially love their white denim for summer and this embossed bucket bag is a perfect option for so many outfits for work or casual weekends. I hope you're all having a wonderful start to your week. For today's Manners Monday post, we're talking about a topic that I haven't touched on before: how to graciously go about supporting a cause with tact and grace. Oftentimes, we become so fired up about our favorite cause that it can be easy to go overboard and bombard someone with all of that passion! 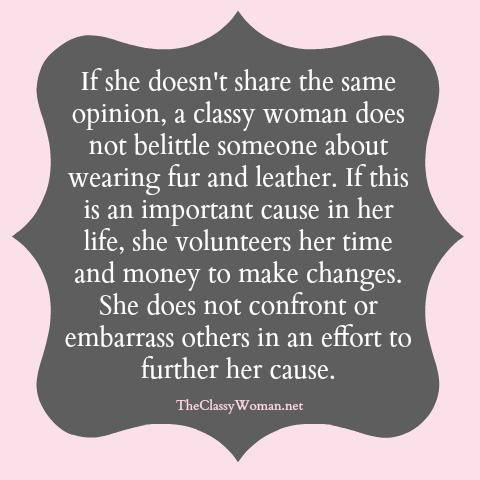 Just because we've adopted a newly energizing vegan diet or have taken a stance against disposable diapering or wearing fur, it doesn't mean that everyone around us shares our same viewpoint. I do believe that at the end of the day most people are just doing the best that they can in life to make the best decisions they know how to make with the resources afforded to them. Can we all do better? Of course we can. Education leads to change. We can all benefit from new information, facts and an open mind when it comes to worldly topics that affect us all in the greater scheme of things. What I see on social media when it comes to religion, politics, the debate of pro or anti-vaccination, genetically modified foods vs. organic (the list could go on here! ), is that when one is behind the anonymity of their laptop or they are not required to be physically face-to-face with another person, words are typed, feelings get hurt and more often than not belittling takes place, brash words are spoken and a lot of people get heated up, alienating others along the way. We all have our own opinions, values, convictions and causes which may sometimes differ greatly from others. However, it's important to remember that tearing another down because of a choice they've made which doesn't fall in line with our own lifestyle is just not becoming of a lady. As someone who holds many causes near and dear to her heart, I always ask myself how I'd like to be treated or how I'd like to receive information. At one point in time, we didn't know what we do today about the very causes we support. Everything in life involves a learning curve. I've been extremely aware of chemical ingredients only choosing natural and organic for many years, my cousin on the other hand admitted recently that she was oblivious to it all-cleaning products, makeup, sunscreen, food, etc., but thanks to a new business she is now a part of, her eyes have been opened. My point is, when we are gentle with people, allowing them the time to figure things out in their own timing and become more aware, they will. Just because we don't agree with someone's lifestyle and choices doesn't give us the right to belittle them, judge them or badger them as this is bullying bordering on harassment. It's not our job to fix or change anyone, all we can do is commit to our own personal growth. This isn't to say that we shouldn't bring up controversial topics in conversation but just tread lightly and be aware of someone's feelings as to not hurt or embarrass them in the process. Sometimes we feel compelled to share information to help others because we care so much about them that we want it so badly for them to 'get it'. What I've found to be a non-threatening way of conveying information gently is to share from my own experiences. An example of this (that has come up a few times among friends and acquaintances) is sharing about how I noweat very little meat because I've learned that livestock is a major source of CO2 pollution and the animals are often treated poorly and live in unclean conditions. While I don't eliminate it completely, my alternative is organic, grass fed beef knowing the animals are treated in a much more kind and humane way and they are not consuming genetically modified ingredients and being pumped with hormones/antibiotics. When things are presented in a way in which people understand that they have alternatives and hear how you've changed your own ways and why, that makes it much more palatable. You may not convince them to adopt new ways immediately but the seed has been planted and after that it is up to them if it is of interest to them. Another approach is to provide literature or website links that provide more information that someone can read at their own leisure. If you have a sample of a really great natural sweetener or a healthier product that tastes great, why not share it with a friend so they can enjoy it when they like. For me, what I mentioned above and the reason for the way I eat has evolved over many years and was due to a booth I visited for 'Mercy for Animals' at a local Vegetarian Fest in one of our favorite local parks who are advocates for farmed animals. Holding their magazine and seeing heartbreaking images and speaking to the knowledgeable staff of the organization helped me to learn new things I didn't know before and let's face it, visuals can be powerful. This same magazine that shared gripping photos also provided great vegan and vegetarian recipes, I loved those positive options. I've always loves animals but since that time I felt a greater sense of compassion towards all creatures including farmed animals who are treated as a commodity. When I was younger I would get pretty amped up about things I was passionate about, over time though I've learned how to soften and refine my approach knowing that kindness and grace wins every time. Now, I'd love to hear from you! How do you share your causes with others gently to encourage change? Every month I have so much fun putting together my favorite pieces for my Classy Woman Fashion Favorites posts. It's essentially a gigantic wish list for me filled with pieces I adore which range from sophisticated looks for a wedding, tasteful swimwear for the beach or poolside, comfortable yet stylish weekend wear, a few of my favorite beauty products that I am currently using and classic accessories that are on trend which I love and I know you will too. For May, I'm all about pops of color, florals, delicate fabrics such as lace, ruffles and in case you couldn't tell-peplum! Lily and I both have several peplum tops, I think it adds so much more to a pair of shorts or jeans than just a plain tee and the layered look via a hem/ruffle is quite popular right now. I'm starting to put together the next post for June. In addition to fashion pieces, I've been working really hard on some room designs for my interior design clients and I look forward to sharing similar posts with my favorite home decor pieces along with the overall room inspirations. You can shop this post by clicking on any of the images in the boutique above and you'll be taken straight to the source and as always, I'm sharing the best sales taking place right now so you can stretch your spring wardrobe budget. Hopefully you all got to sneak a peek at Nordstrom's Half-Yearly sale which was going on for 10 days and just ended yesterday! ANN TAYLOR: Extra 30% off sale styles. I own this top from the sale. NORDSTROM: Designer Clearance up to 40% off select styles. SHOPBOP: Designer Sale + free 3-day shipping. Which styles here get you excited for summer? I hope you're having a great week so far. Thanks for stopping by!